WASHINGTON, Pa. — Jo Lynn Seagriff wanted to be a new grandma, not a new mom. Her 14-year-old daughter, Caroline, and 17-year-old son, Dalton, would leave home in a few years. Her oldest, Collin, 22, lived in Florida with his fiancee. But the day before Thanksgiving 2016, Collin died of an opioid overdose. The day after Thanksgiving, his fiancee announced she was pregnant. She said Brayden’s mother, who lives in Florida, continues to struggle with addiction. As the opioid epidemic continues to kill thousands, social safety nets and the foster system appear ill-equipped to handle the crisis surrounding the youngest victims of the epidemic: The children left behind when parents die. Across the country, 2.6 million children are being raised by relatives, according to a study from Generations United, a nationwide nonprofit organization that focuses on bridging the gap between older and younger generations, and the most common reason is substance abuse. In cases where children are placed in foster care because of substance abuse, one-third are placed with relatives. Seagriff didn’t yet have full legal custody of Brayden when she talked to the Tribune-Review in August. That meant she couldn’t enroll him in day care. Because she couldn’t enroll him in day care, she couldn’t work. Without legal custody of Brayden — a legal process that takes time and attorneys and hearings — the family didn’t qualify for benefits or medical assistance. Social services suggested she reach out to AARP for resources and direction. Seagriff is 49. Legislation that took effect in July — the Supporting Grandparents Raising Grandchildren Act, sponsored in part by Sen. Bob Casey, a Pennsylvania Democrat — created a “one-stop-shop” of resources that can help grandparents who find themselves in the midst of a second go-round in raising children. The legislation created a clearinghouse of information. But it did not directly include funding for grandparents. That’s not enough, Seagriff said. More help — more funds, more guidance, more anything — is needed, she said. The opioid epidemic is directly related to the steady increase in the number of children in the foster care system or engaged with the Office of Children, Youth and Families, said Marc Cherna, the director of the Allegheny County Department of Human Services. Other statistics related to CYF services have increased as well, Cherna said. Child abuse and neglect allegations in Allegheny County rose to 15,613 last year from 13,178 in 2015. Substance-use allegations rose to 2,967 from 1,913 during the same period. More than half of the children referred to his office are placed with relatives, Cherna said. Allegheny County is unique in that CYF will often provide assistance to the relative in the form of Medicaid, a clothing allowance, a stipend or other assistance. Of the total referrals, 65 percent end up with a relative who will receive assistance through the program. But if relatives don’t let CYF or another agency know they’ve started caring for a child, the programs can’t help. Grandparents stepping up — taking on parenting their young grandchildren when they never expected to be raising small children again — has kept Westmoreland County’s foster care numbers from skyrocketing, according to Adam Garrity, a program specialist with the Westmoreland County Children’s Bureau. While the number of drug and alcohol-related referrals in the county has increased each of the past three years, the percentage in which opioids are cited as the abused drug has decreased, Garrity said. There were 757 such referrals in 2017, up from 634 in 2016 and 537 in 2015, he said. The number of referrals in which opioids were named as the main drug fell to 27.5 percent in 2017 from more than 35 percent in 2015. The national average, he said, is about 38 percent. More than 40 percent of children end up with kinship caregivers — relatives, often grandparents, Garrity said. For Carol Ann Lubovinsky, the struggles go beyond just caring for her grandchildren, Eban and Bobby. Their mother, 26-year-old Amanda, died of an overdose in her Washington apartment in March. She’s really just a memory to her 7- and 10-year-old sons. “She’s just a person they talked to on the phone. But they don’t like to talk about her — her being in the ground, being dead. They won’t go to the cemetery,” Lubovinsky said from her Mount Pleasant home in Westmoreland County. She has had custody of the boys since early 2016, but Amanda and the children were living with her before that, though Amanda came and went and often disappeared from their lives for stretches of time. Amanda moved home while she tried to get clean, and she consistently snuck out of the house. “She came home one night, and she fell asleep three times during one diaper change with Eban,” Lubovinsky said. She made the decision to file for custody the next day. She and Amanda carpooled to the emergency custody hearing. She didn’t. Lubovinsky said her daughter got clean in January 2017 but then relapsed. Lubovinsky would drive the children to Amanda’s apartment each weekend. One weekend in April 2017, Amanda dropped off the boys after a weekend with them at 2 a.m. on a Monday — a school night. “That was the last time she got to see the boys,” Lubovinsky said. Raising young boys “wasn’t what we were expecting,” she said. At the end of January, Brayden went back to his mother for 10 days. Then he came to live with his grandmother permanently. On Feb. 6, Seagriff picked up the boy at the airport in Florida, and her quest for custody started. 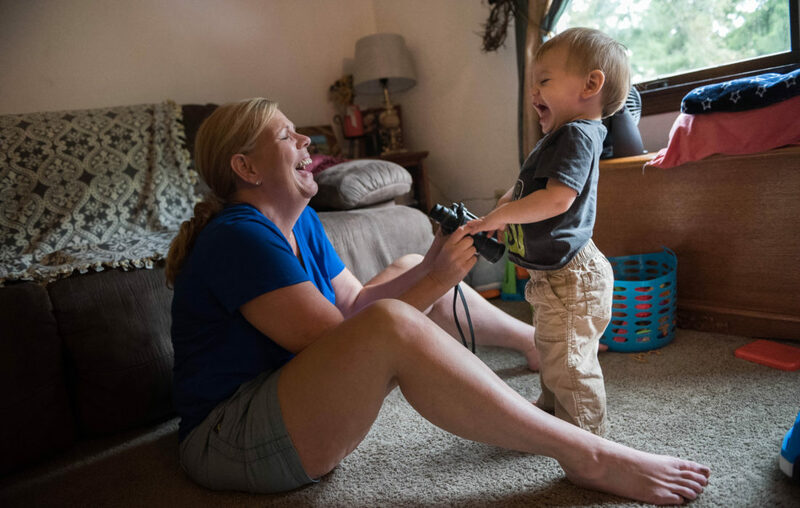 She said she would do it over again if she had to, and she doesn’t want anyone to think that the opportunity to raise Brayden is anything less than a blessing. But, she said, that doesn’t mean it isn’t challenging. “I do the best I can not to cry on a daily basis, because you can’t. I’m not the strongest person on the planet. There’s days when I haul off and yell at her,” Seagriff said, gesturing toward her daughter, Caroline. “Later, I have to come back and apologize. That’s hard for a parent to apologize.